so i've decided i need your help...this blogging is bogging me down! i'm inspired and excited to take photos but it just seems that by the time i'm ready...it's dark out or i'm in my pj's annoying, yeh?? ahh, so if you bloggers have any tips on how to fit it all in, pplleeasssee plleasseee let me know! i love you all and trust you 100%. but on another note, school has been tough but good at the same time...i'm so ready to finish off strong (crossing my fingers)! hehe oh and, last weekend i went to big bear with my botany class! and even though i'm certainly not a botanist, it was so splendid! my girlfriends and i had a great and memorable time...we cooked, cleaned, hiked, chatted, told stories and ate...A LOT OF GOOD FOOD! i mean who wouldn't love a professor who makes everyone blueberry pancakes and french toast from scratch! so yumm. hehe i hope you all are having an inspiring week with smile filled days! have a smiley rest of the week! Great post! Totally feel you on the outfitpostblogging thing. Just keep at it! Youre doing great. I love those shoes! Nice outfit. your hair colour is amazing!! Ι totally understand you Kaitlin! My bf is away, I have no one to take pictures of me, my camera doesnt get a remote control..I'm freaking out! Also I work 10hrs per day, namely when I get back home its dark and I'm tired. My best advice is to carry your camera with you at the university and then have one of your friends take pic of you..
your outfit is so great, the colors are amazing and the layers look so cozy. I totally know how you feel, sometimes there just aren't enough hours in the day to fit blogging in too. Sometimes I'll hold on to photos of outfits from the weekend, then post them when I have a really busy day. I love your blog. your style and vibe are great. would love it if you'd check mine out and follow me back if you like. Thanks! Cute look! Love the denim over your sweater!! Your hair is soo pretty! yep, you can be my redhead sweetheart any day haha. I'm diggin this girly grundge-tastic look. the mixing of fabrics is AWESOME! thanks for the comment on my blog. i looove your hair, and your cute little slouch hat. you look so cute. it's hard fitting blogging in! guest post bloggers help me a lot if i am going on a vacation they fill in for me. Big Bear sounds so fun. I have great memories of that place! If blogging interferes with your priorities, then it's time to evaluate what's most important. Sometimes a break is good if you feel like you need it. It's also a good way to gather inspiration. I'm the same way - worse even. I think it is hard for everyone to stay motivated and inspired. I find looking and anything that inspires me helps - art, fashion, movies, speakers. It doesn't even have to be about what I need motivation for. Seeing other people being creative at whatever they do makes me want to be creative as well. Love this outfit! Thank you for your lovely comment, I'm so glad I found your blog, I'm now following you. Thank you for the follow! You look great, I see that you have a versatile and cool style, great blog! Totally know what you mean, the outfit part can be overwhelming. Maybe try doing 2 at a time if you can before it's dark. Either way I love this outfit and the denim brings out your eyes so much. Gorgeous photos and the beanie is perfect! Kaitlin!! Its crazy how you look good in everything!! LOVE your shoes! you look awesome. Shoes and Beanie look great together. I love how you're always dressing up an otherwise casual and simple outfit with wonderful heels! It really is hard getting your pictures in before dark. I just try to make sure I take as many outfit shots on the weekend as I can & then publish them throughout the week. It's kind of "cheating" lol but w/e it work :) I'm so jealous of your teacher making you a homemade breakfast!! Your hair color is so cool, I really love those shoes. just found your blog and love it!! new follower here! you are so pretty! Love you hair! And those pants rock! Love the outfit, and you are seriously BEAUTIFUL! i absolutely just adore your style, and all of these picture! I so feel you about the photographing your outfits it can get tricky, just stay motivated by thinking about all the comments and followers that love your style! Im in love with your shoes, cool look! I'm your new follower!! WOW!! YOU HAVE A GREAT STYLE! WOW! YOU HAVE A GREAT STYLE! Love your blog, your style is great! I prefer to take photos for outfit posts outside, but i have found a nice little nook indoors that i resort to if i lose the light or the weather is crap. that has definitely helped me! ps, check out my earring giveaway! Love your hair *_* You look wonderful.Love your sweater ! I love your style, your hair and your shoes are amazing! 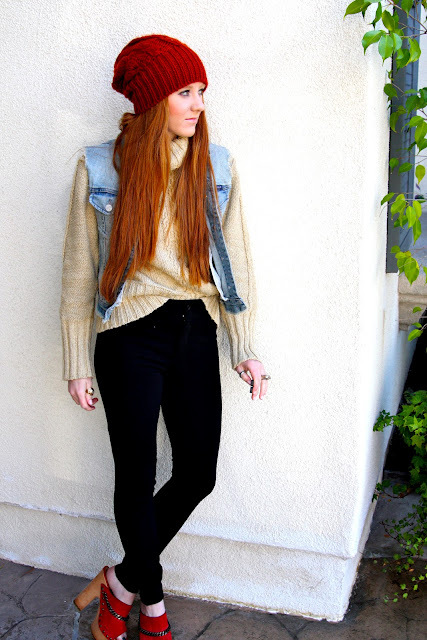 This is a really cool look :) I love the knits!